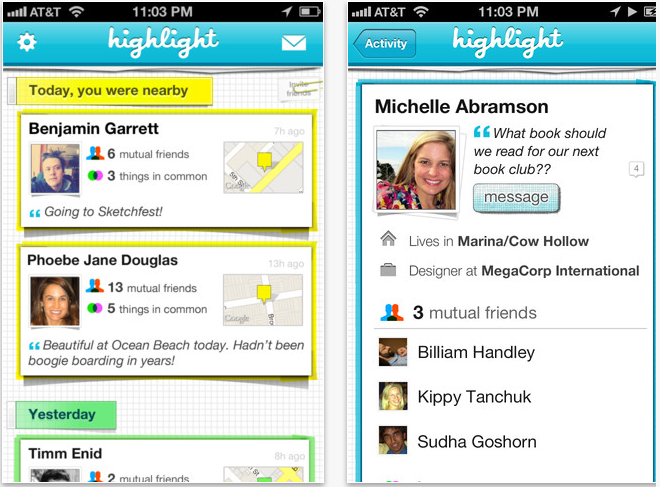 Highlight, a buzzy iPhone app that takes location-sharing to the next level, has raised funding. It’s just a seed round, but a significant one — the company isn’t disclosing the amount, but it should tell you something that the lead investor is Benchmark Capital, which doesn’t usually do seed investments, as a matter of practice. Other investors include SV Angel, CrunchFund, Andy Bechtolsheim, Charlie Cheever and Ariel Poler. Highlight, which was just released a month ago, has persuaded an impressive selection of VCs and techies to share their actual locations with people they don’t know. Just in the past few weeks, I’ve been notified on Highlight that a VC was within 150 meters of me at a ski resort, that an early Facebook guy was merging onto 280 at the same time as me, and that a Google exec was a block away from my home in San Francisco. And I was officially “friends” with only one of the three people — the others just had mutual connections in common. What seems to make people feel comfortable with automatically sharing their location on Highlight is that it’s not shared all the time. Users get pinged when someone with mutual friends or common interests on Facebook is nearby, with a one-time snapshot of that person’s location. 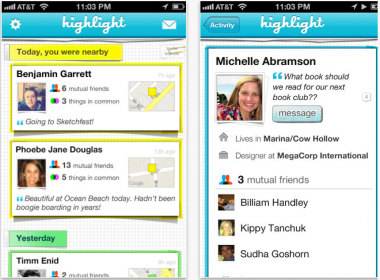 Highlight is also making its app available outside the U.S. starting today. Co-founder Paul Davison told me he’s especially eager for people to use Highlight when they travel. There’s currently no setting to only get Highlight notifications about people you are already friends with — by design, the app is meant to encourage serendipitous connections. For me personally, that’s a bit of a chafe in my hometown, but I can see how it might be exciting to meet friends-of-friends while traveling. Davison also said a new version of Highlight will be released before the SXSW festival in Austin, Texas, next week that’s built to decrease its pull on users’ batteries (which is indeed an issue with constant location-sharing), and to give users tools to mark people as interesting and friend them on Facebook or follow them on Twitter. Highlight started when Davison was an entrepreneur-in-residence at Benchmark and still has a team of just two people, based in San Francisco. Competitors include Glancee.